DE Ezekiel Ansah - DET - Ansah (ankle) left the team's Week Two game early because of an ankle injury - he'll be evaluated further on Monday to determine the exact nature and severity of the injury. Robert Ayers suffered an ankle injury in Sunday's blowout against the Cardinals. He was spotted in a walking boot after the game which signals to me this may be a long-term injury. We should know more about his status over the next couple days. Rookie Carl Nassib was impressive in his first NFL start in the season opener. However, he broke his hand Sunday and will likely miss at least a couple of weeks. Former University of Kentucky standout, Avery Williamson, injured his back in the Titan's Week 2 matchup against the Lions. He is reportedly feeling better and is looking to return to practice Wednesday. He's not 100% to play this week but is trending in the right direction. DeMarcus Ware has an ulnar fracture (i.e. a broken forearm) that occurred Sunday in the Broncos' Week 2 win over the Colts and is expected to miss 3-6 weeks. Rookie DeVondre Campbell suffered an ankle injury in last Thursday's practice which caused him to miss Sunday's game. It's a bit unclear on how long he will be out, but I'm expecting he will miss at least one more game. Veteran Sean Weatherspoon filled in on the weak side in his absence. Dont'a Hightower failed to practice last week due to a knee injury and wound up being inactive after being considered doubtful to play. This may be a multi-week injury. Fourth-year corner David Amerson suffered a concussion late in last week's game and is currently in the league's concussion protocol. He will have to get clearance before getting back on to the field. Prince Amukamara of the Jaguars tweaked his hamstring and did not practice all of last week, so it wasn't a surprise when he was listed as OUT for Jacksonville's Week 2 contest against the Chargers. Morgan Burnett pulled his hamstring in Sunday night's contest against the Vikings and did not return to the game. He's had a history of soft tissue injuries so this has to be a bit concerning for IDP owners. I'll track this DB1's progress throughout the week. Jahleel Addae sustained a broken collarbone in the second half of Sunday's game and is expected to miss at least four weeks. Ibraheim Campbell was benched in favor of rookie Derek Kindred. Hence, why a player a lot believed to have DB1 potential heading into the year had only 1 solo tackle on Sunday. He should be dropped in all redraft leagues for the time being. Lavonte David had his first career "goose egg" in Week 1 which is likely to get owners panicked about his value moving forward. He was dealing with a minor shoulder injury which could have played into his poor performance. In anticipation of the flooding questions concerning this situation, I would NOT entertain dropping David. It's one bad week and that doesn't make a trend. Yes, Kwon Alexander's play could siphon off some of David's value and he may not be the top 5 LB as most drafted him as, but he still should have LB2+/LB2 value at minimum. D'Qwell Jackson's snap count increased back into the 90%+ range in Week 2. However, he still underwhelmed with just four solo tackles. Some of that was the game flow. But I think it's quite possible a changing of the guard is taking place in Indy and that Sio Moore outproduces Jackson in 2016. Given the opportunity, Jackson should still make for a serviceable LB3+ in most leagues, it just doesn't appear he's going to come close to his 2015 production. For the second straight week, Denzel Perryman only participated in about half of the defensive snaps. 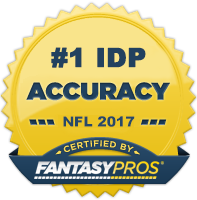 Although it pains me to say this since he was an IDP darling of mine heading into the year, it's time to cut bait with him in redraft leagues. Until San Diego trusts him to play near every down, he's just not going to hold much value. And there are a plethora of startable options at linebacker on the waiver wire right now, so now is the time to make this move. Raiders Head Coach Jack Del Rio stated earlier this week that he is planning on switching things up defensively after a poor start to the year for that unit. He stated that rookies Karl Joseph and Cory James would see more playing time. This makes Ben Heeney and Keith McGill expendable in redraft leagues. DE Dante Fowler (JAX) - Fowler generated excitement with a strong training camp and preseason. That didn't translate to much production in week 1 of the regular season but it all come together last week for the sophomore player out of Florida as he generated two sacks to go along with 6 total tackles. I expect there to be a lot of week-to-week inconsistency with him but the likelihood of more multiple sack weeks in the future is strong. DE Frank Clark (SEA) - Clark has now had sacks in back-to-back weeks to start the season bringing his total to three on the year. He spent most of last year learning behind Cliff Avril and Michael Bennett, but seems primed to assume a larger role this year. He's a must pickup in dynasty leagues and worth a look as a DL3+ in redraft formats. DE Timmy Jernigan (BAL) - Jernigan, a third year player out of Florida State, generated some buzz heading into last year but failed to do much in the box scores. This said, he's off to a hot start to the 2016 regular season with a sack in each of his first two games and fairly strong tackle numbers to boot. He's not the highest of upside players on the waiver wire but has a solid chance at steady DL3-DL3+ production. LB Craig Robertson (NO) - Robertson had another monster fantasy week filling in for the injured Dannell Ellerbe. He now has 24 total tackles in two games and has established himself as the #1 IDP option on the Saints defense. He should continue to be an every week play for as long as he's the starter. LB Zach Brown (BUF) - Brown was catapulted into an every down role after rookie Reggie Ragland went down with a season-ending injury in preseason. He showed flashes of IDP potential while in Tennessee but was plagued with inconsistent play and limited opportunity. He's made the most of his chance in Buffalo and has 22 total tackles in two games. He will have to compete with the other Brown for tackles but the Bills defense is likely to see a lot of field time and he will get the benefit of a generous Buffalo stat crew in home games which should help buoy his numbers. LB3-LB3+ moving forward. LB Deion Jones/Sean Weatherspoon (ATL) - The Falcons defense faced a plethora of attempts last week against the Raiders so some of the production from Jones, Weatherspoon, and Kemal Ishmael was inflated. However, there is opportunity to be had here and both linebackers listed are worth pickups in most leagues. Weatherspoon has been the more effective of the two on the field but is likely to head back to the bench once rookie De'Vondre Campbell is healthy enough to play. Jones' production should continue to increase throughout the year as he gets more experience. LB Tahir Whitehead (DET) - DeAndre Levy was largely absent from the box scores in week 1 and missed week 2 with a quad injury. Given that he was downgraded late in the week, there's no guarantee he suits up for week 3. If Levy sits out again, Whitehead becomes a must-start in most leagues against the Packers. LB Zach Orr (BAL) - Orr, an undrafted free agent out of North Texas, has doubled the tackle production of teammate C.J Mosley (16 to 8 total tackles) and is shaping up to be this year's Daryl Smith. He plays aggressive which causes him to over pursue at times but is something that should help keep his floor relatively high. LB3- with some big play potential. S Tyvon Branch (KC) - Branch had yet another strong fantasy performance in week 2 bringing his yearly tackle totals to 17 (16 solo) to go along with two pass deflections. With Tyrann Mathieu playing free safety this year, Branch has been manning the slot corner position which has proved to be very productive. He's a player with a nose for the ball, so he becomes a strong DB2-DB2+ as long as he continues in this role for Arizona. S Andrew Sendejo (MIN) - The Vikings felt comfortable enough with Sendejo's skill level to release Michael Griffen prior to the start of week 1. He's been an above average contributor in the box scores with stat lines of 4-0 and 9-2 respectively in the first two weeks. He's also managed a fumble recovery in each of those weeks. He doesn't have a ton of big play upside but should see enough opportunity to be a fantasy starter in most leagues. S Kemal Ishmael (ATL) - Ishmael is likely to be one of the top waiver wire pickups in IDP leagues this week after an eye-popping 15 total tackle game (13 solos). He's filling in for injured rookie Keanu Neal and will have DB1- value for as long as he continues to start. Ishmael has shown viable fantasy promise before, so his production isn't all that surprising especially considering the inconsistent play of the front seven.